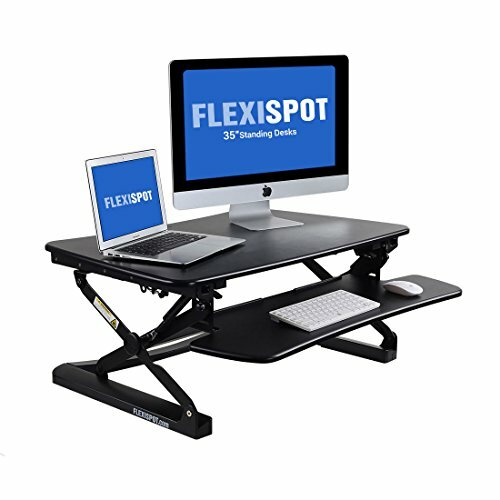 FlexiSpot's desktop workstation provides an easy way to transition between sitting and standing throughout the workday. Our spacious desks offer a deep work surface, a wide keyboard and instant tablet integration. These quality workstations offer smooth up/down motion, twelve height adjustment settings and ergonomic monitor mount compatibility. Smooth and Stable Movement: FlexiSpot's gas spring hovering system allows the workstation to smoothly adjust for sitting or standing with just a light squeeze of the handle. Large Work Surface, Wide Keyboard Tray: offer a deep, wide surface. There's room for your work materials and enough space to put your monitor at a comfortable reading distance. Ergonomic Benefits: Choose from 12 height levels as you transition between sitting and standing throughout the day. Our products support a better posture and healthy wrist and arm positions. Straight Up and Down Movement: Our workstation rises and folds vertically, within its own footprint. There's no need to make spatial accommodations, as may be required in comparable products. High Quality Construction: Support up to 35 lbs., has undergone extensive testing for balance, stability, and movement - including a fatigue test of 6,000 height adjustments.